This turned out to be really tasty. I’m glad I took the time to make this instead of opening up a can of chili like I normally do. Those are always so full of salt and other preservatives…it kind of looks like dog food! The flavor and texture were so good, a little smokey, a nice kick and even a little sweet. 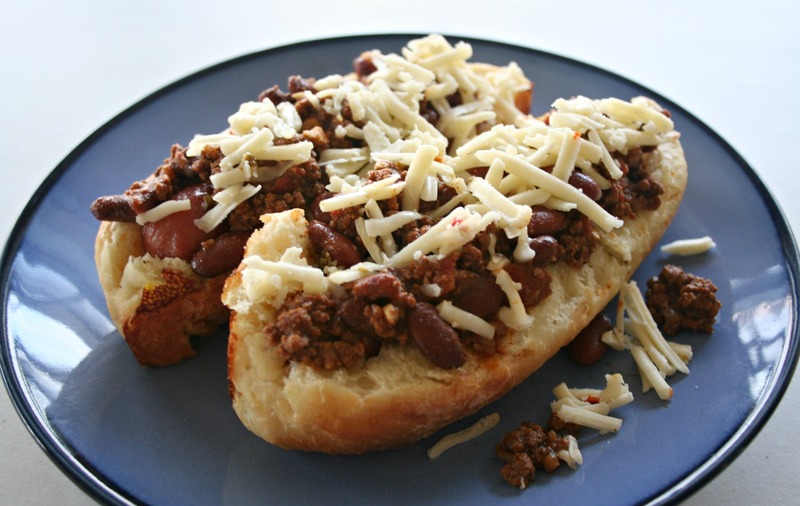 We enjoyed this over nitrate/nitrite free all beef hot dogs and these homemade buns. The leftovers would be fantastic on top of fries, tater tots, or just with some cheese melted on top. Thanks for reading, enjoy! Heat the cast iron pot over a moderate heat. Add the oil, garlic, and onion and cook until golden, stirring occasionally, about 8 minutes. 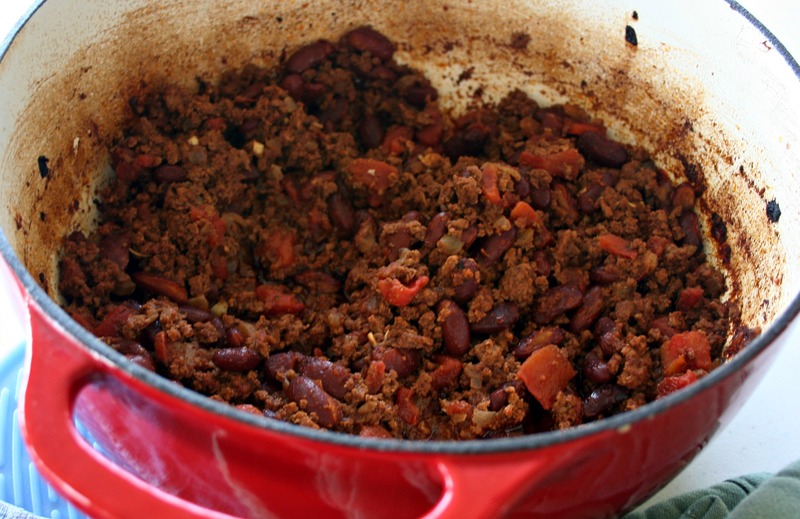 Turn the heat on high, mix in the ground beef, oregano, chili powder, cumin, and stir until the beef mixture is deep red in color and the meat is no longer pink. Add the beans, diced tomatoes, and water into the beef mixture. Bring it to a boil, switch off the heat and cover with a piece of parchment paper and then cover with the lid. 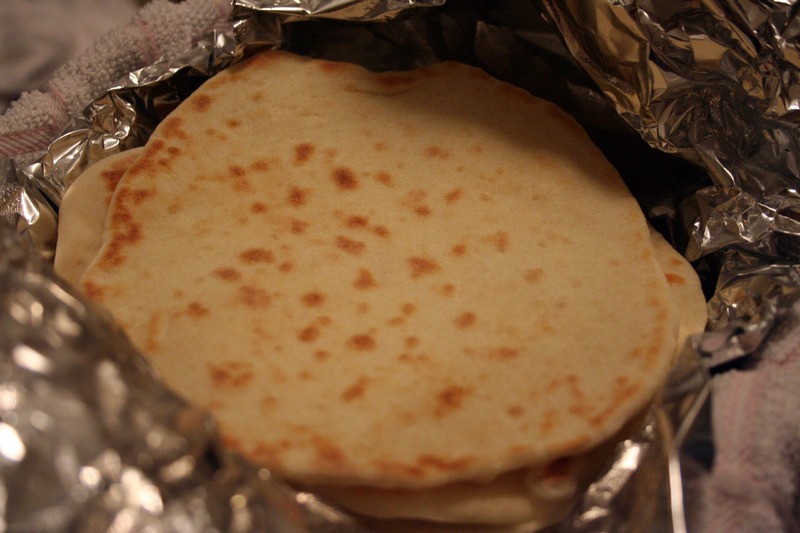 Cook in the preheated oven for about 1 ½ hours and season with sea salt. 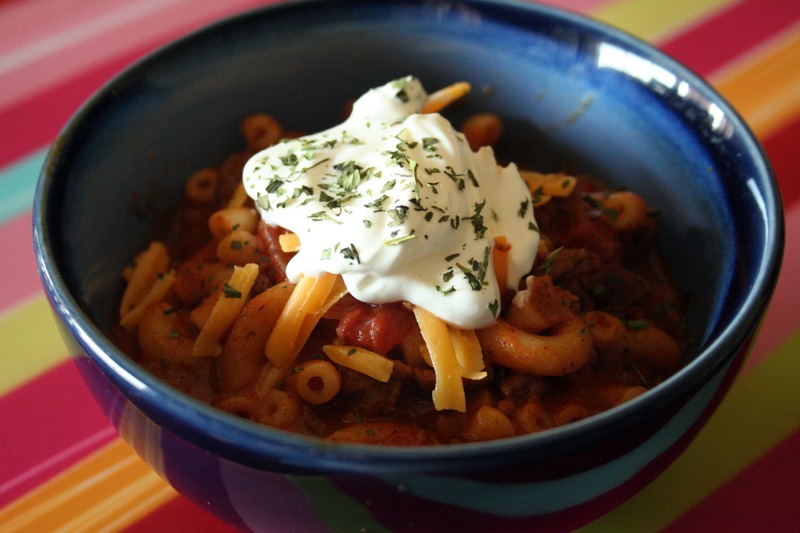 Serve the chili with cheese, cilantro, and sour cream, if desired. I have wanted to try this recipe for sometime. Just yesterday, I picked up my first box of produce from a local organic co-op and in this weeks box there are Roma tomatoes! I can’t let these go to waste and I know I wont use this many in a week. What better way to use these than to make a homemade pasta sauce? I do need to buy about another pound at the store, but that’s ok – I still wanted to try this. This was really tasty and I’m glad I went with my “doctoring-up” instincts or this wouldn’t have had enough flavor for us. I didn’t add the red pepper flakes while I cooked the sauce so my spice-a-phobic daughter wouldn’t have something extra to complain about. It’s like pulling teeth to get her to eat anything! 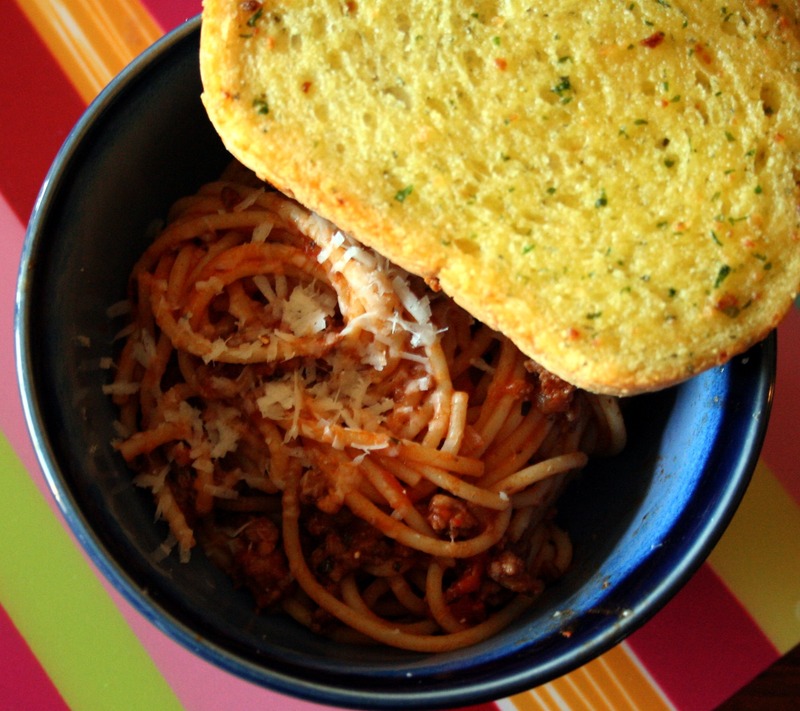 We all enjoyed this with roasted garlic bread, which is obviously not pictured…it was that good! I will have to make it again sometime and make sure I keep my hands off until I get a picture. I used my go to garlic bread recipe on half of this loaf and used an entire bulb of roasted garlic in place of the chopped. It was unbelievably good – a little too good because I couldn’t help myself from eating three pieces! I joked that I was “carbo-loading” for the gym tomorrow. I haven’t indulged like that in a whole month 🙂 These are destined to be “repeat offenders” – thanks for reading, enjoy! Chop your tomatoes into bite-sized chunks. Layer the tomatoes on a sheet pan that has sides. Add olive oil, garlic, and balsamic vinegar. Mix well. Roast for 25 minutes or until tomatoes are bubbly and browning in spots, stirring once or twice. Set aside. In a large skillet set to medium heat pour in about a tablespoon of olive oil and add the diced onion. Cook until slightly caramelized then add your roasted tomatoes to the skillet. Stir to combine and add vodka, cook for 5 more minutes. 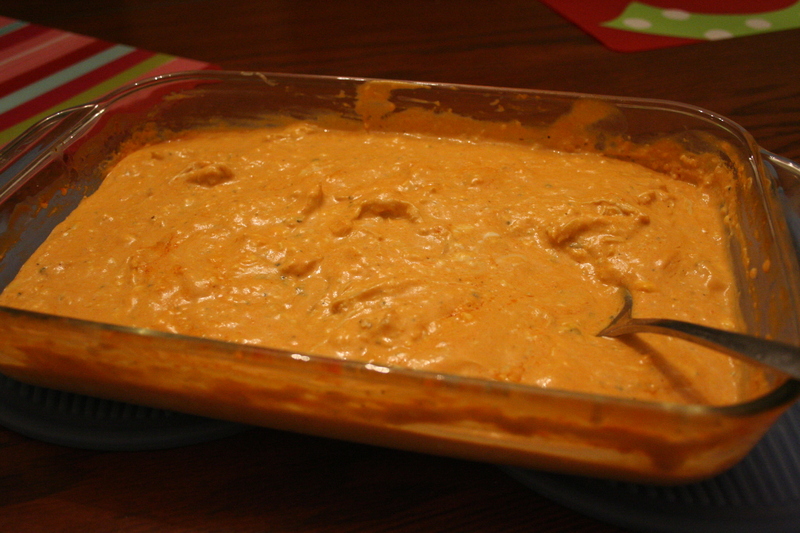 If you prefer a smoother sauce, blitz the mixture with your stick blender. 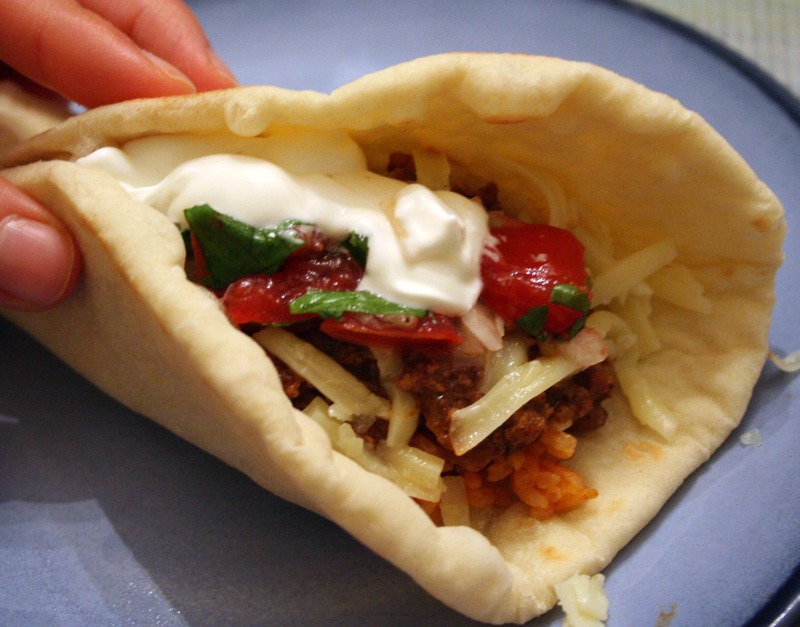 Add in Pecorino Romano cheese over top and toss in chopped basil – taste for seasoning. Set aside. Put a large pot of water to boil, and add a generous amount of kosher salt to the pot. Add your pasta and cook according to package directions. 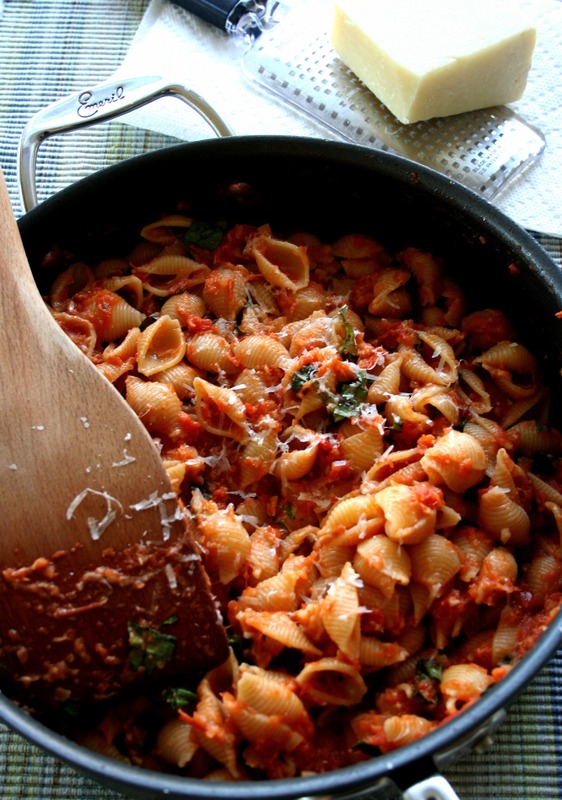 Before you drain the pasta, reserve about two cups of the pasta water. Add the drained pasta to the sauce, stir to combine, add the pasta water as needed to thin out the sauce. Serve with roasted garlic bread and a green salad. 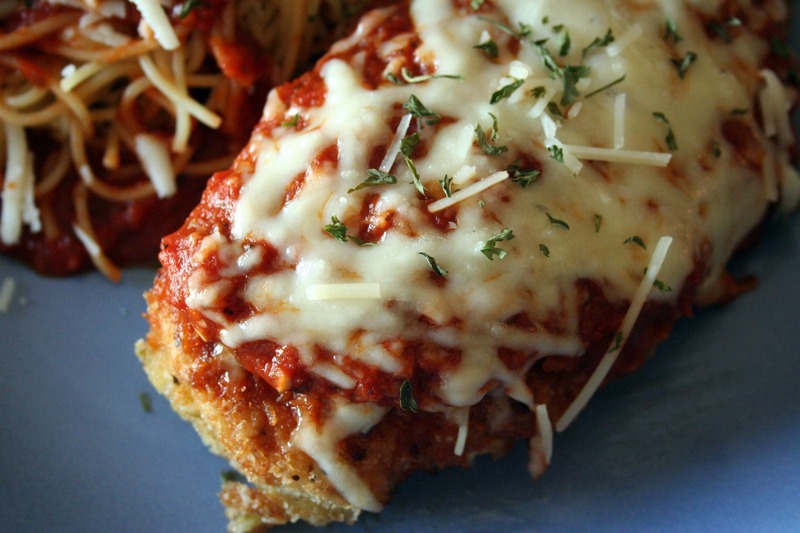 Quick Post: This recipe is a combination of a few different techniques and ingredients I pulled together from some simple chicken parm recipes. I liked the addition of Panko in this recipe verses the typical Italian breadcrumbs. I pulled the shallow fry method from the same recipe, but baked the chicken, sauce and cheese in the oven before serving like this one. 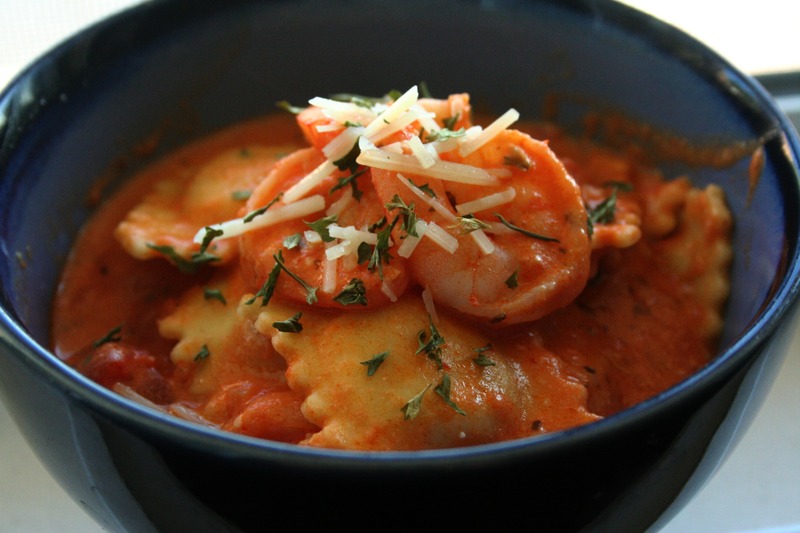 Oh, and I used my favorite marinara sauce for this recipe. 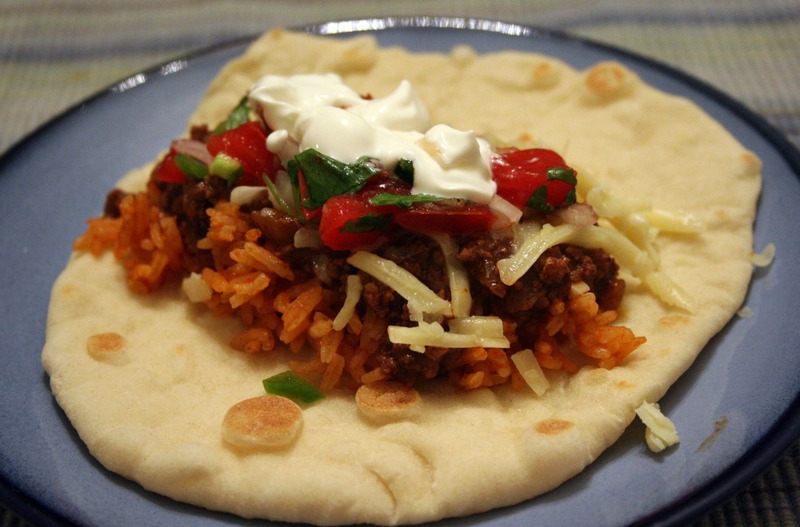 This was a tasty and filling meal – even my picky eater happily ate this. Thanks for reading, enjoy! 1. Preheat oven 400 degrees and put a large pot of water to boil. 2. Clean and dry your chicken well. Set up an assembly line for your breading – one shallow dish for your flour, one for your egg, and one shallow dish for the season Panko. Season your chicken with kosher salt and pepper then lightly coat with the flour, then dip in the egg mixture, then coat the chicken with the seasoned Panko – set aside. 3. Heat oil and butter in a large, heavy bottomed skillet over medium heat until a pinch of the breadcrumb mixture sizzles immediately when added. Add the chicken breasts and fry without disturbing for 5 to 6 minutes, or until golden brown. 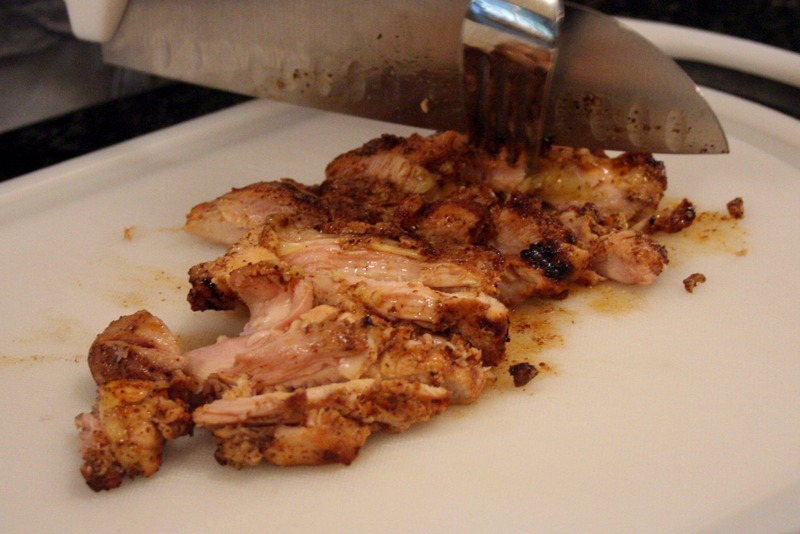 Using tongs, turn the chicken breasts and fry another 4 to 5 minutes, or until just cooked through and golden brown. 4. Place the finished chicken in a 13×9 baking dish. 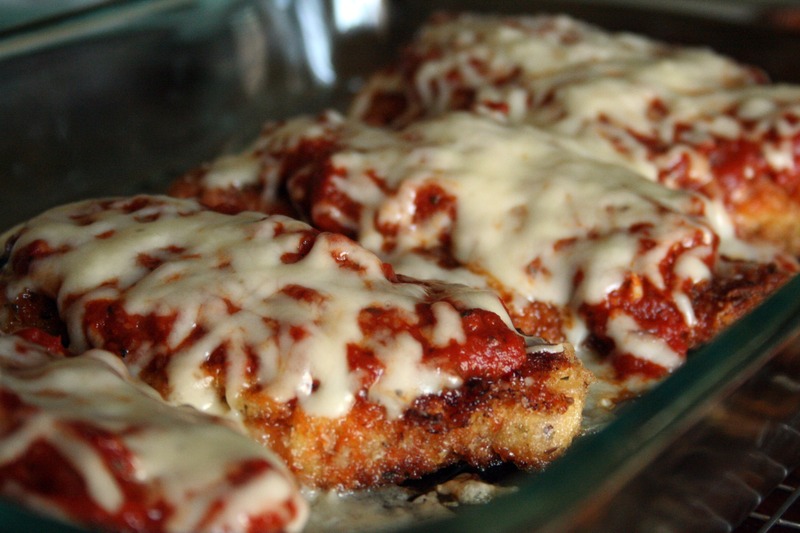 Top the chicken with enough marinara sauce to cover the tops of each, then sprinkle the parm and mozzarella cheese. 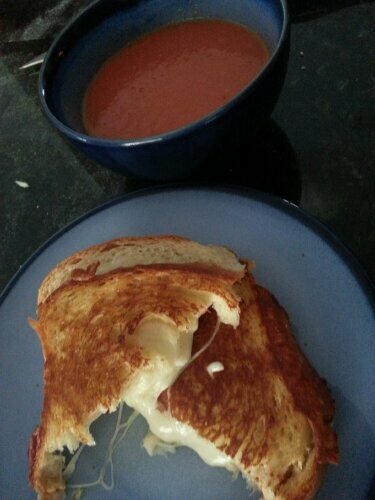 Bake for 10 minutes or until the cheese is melted. I love having a well stocked pantry! All I needed to pick up from the grocery store today for this meal was the ground beef. This is the kind of meal I like to make when I don’t want to put too much effort or thought into dinner – sorry, family! I don’t think they’ll mind;) They’re concern isn’t how much time a meal took but it does have to taste good, of course. This recipe delivers smoky, slightly sweet flavor with a hint of spice. I didn’t add quite the full amount of green chiles for Little S – she’s so picky as it is, I didn’t want her to feel justified in not liking this meal. It’s so good and she’s still moping at the table picking at her food. M on the other hand loved it and had two helpings! God has a sense of humor is all I can say – they’re so different:) Either way, I’m going to have to make this again soon. Thanks for reading, enjoy! 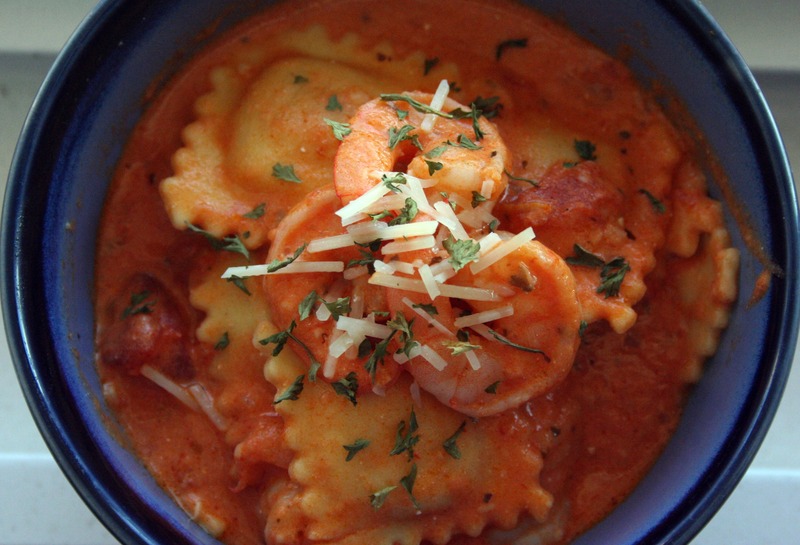 This is so good, super simple but oh, so flavorful. While looking through Publix’s online ad, I discovered that boneless, skinless thighs were on sale this week and immediately I thought of this recipe. 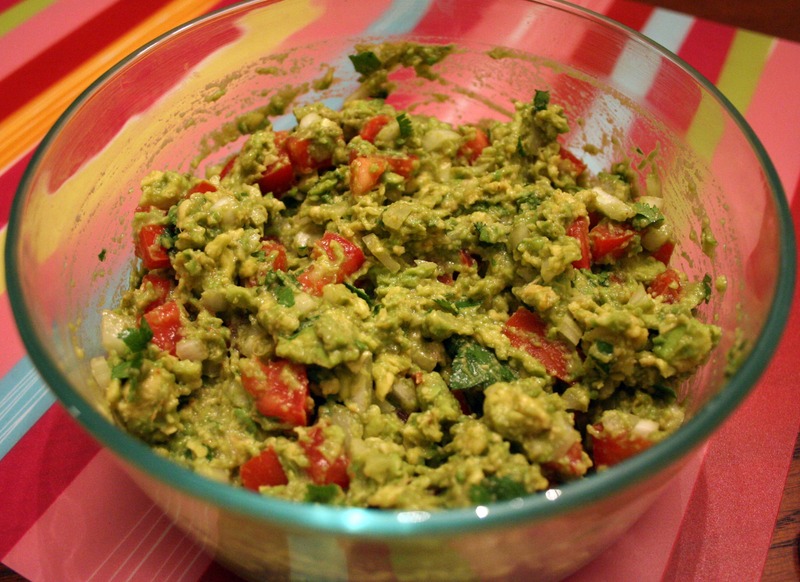 It’s marinated in some of my favorite flavors – lime, cumin and chili powder. 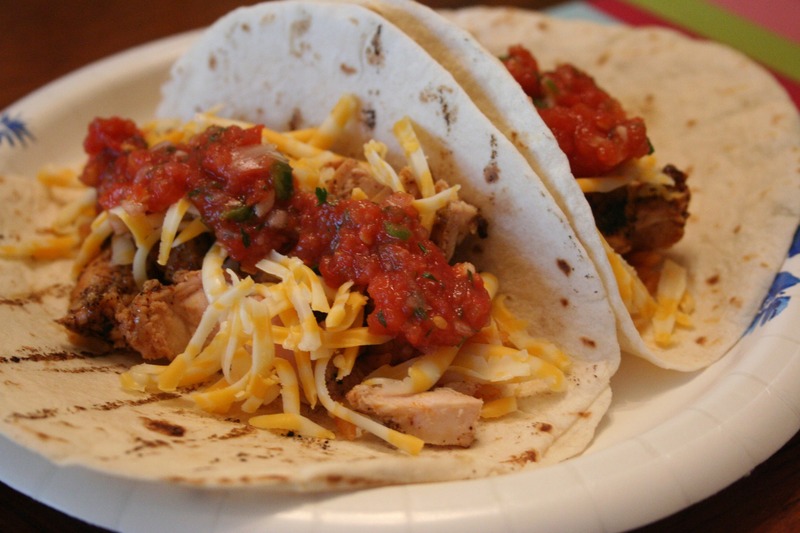 I’m serving these grilled with tortillas, this salsa (I was craving it) and my “orange” rice. 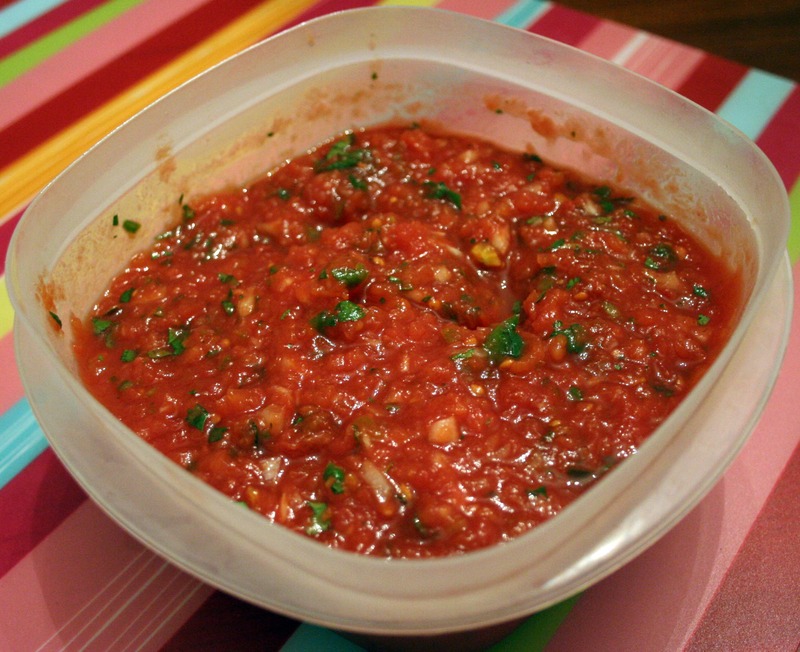 I’m pretty plain when it comes to taco night because there is always rice, cheese and pico de gallo, or in this case salsa. My family is (thankfully) easy to please most times:) Thanks for reading, enjoy! 1. Combine all ingredients minus the chicken. 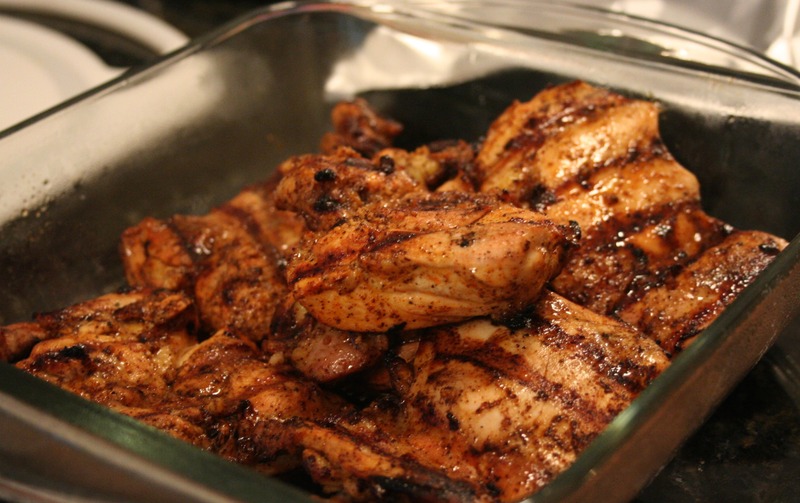 Place the chicken in a gallon size Ziploc bag and pour the marinade over top. Mush the bag to coat all the chicken well. 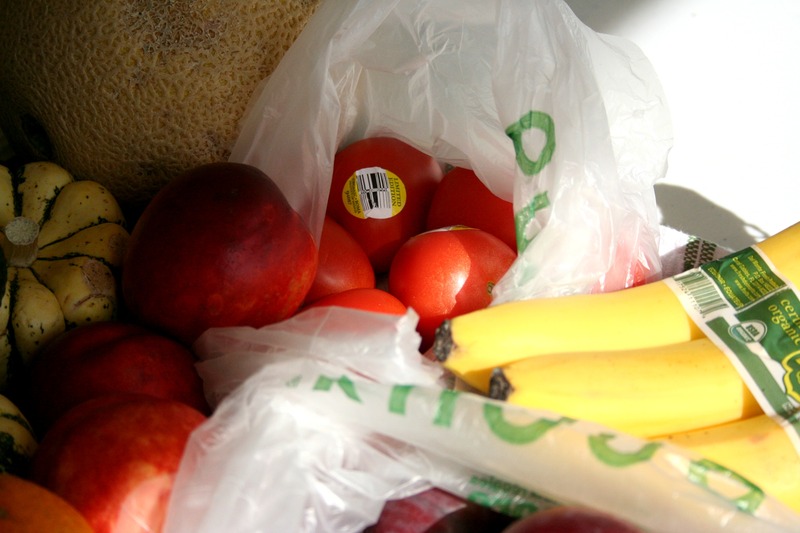 Place the plastic bag in another container to protect the rest of the fridge in case the bag leaks. Marinade for 4 but no longer than 8 hours. 2. Preheat outdoor grill and cook the chicken pieces for 7 minutes a side. Take off grill, cover with foil and let rest for about 5 minutes. Enjoy!